Santa Ana, CA. — Stack’s Bowers Galleries’ August 14-16 Official Currency Auction of the ANA World’s Fair of Money was a great success, with many items exceeding estimate on their way to new homes. Two name collections, Part II of the Joel R. Anderson Collection of United States Paper Money and Part I of the John E. Herzog Collection of United States Treasury Bonds attracted intense interest, as well as enthusiastic bidding. In all, the paper money portion of the firm’s Philadelphia auction realized $12,294,094. United States of America. Act of March 31, 1848. $5,000 6% 20-Year Registered Bond. Hessler X119H. Specimen. Uncirculated. 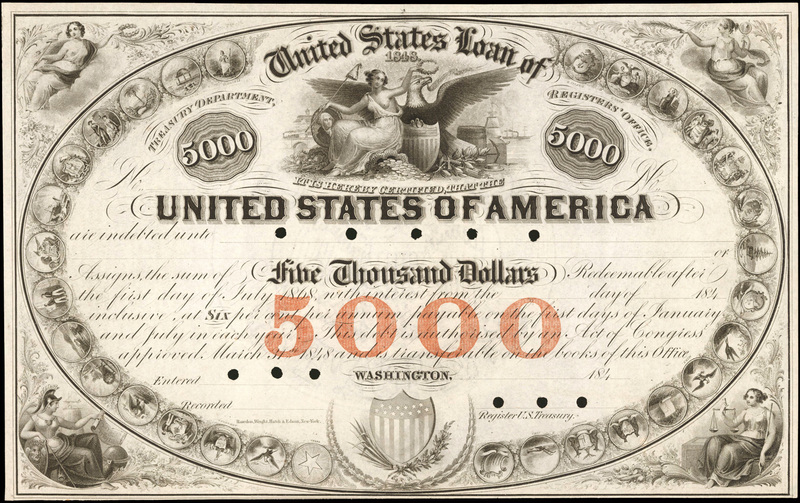 The first section of United States paper money presented in the Stack’s Bowers Galleries’ auction was the John E. Herzog Collection of United States Treasury Bonds, which crossed the auction block on the evening of August 14. This group of 112 lots proved once again that collections patiently formed over decades achieve superb results at public auction. Numerous pieces realized multiples of their previous purchase prices, some as much as a dozen times. Leading the Herzog results was lot 11034, a $5,000 Fr. 211 Face and Back Proof pair graded New-62, which realized $48,000 (it last sold in 1990 for $7,150). Classically styled bond specimens from the 1840s were popular, as displayed by lot 10017, an 1848 $5,000 Specimen originating in the Vattemare Albums that realized $18,000 in uncertified Uncirculated condition. Historical financial documents were of great interest; lot 10004, an 1840 Charlotte Mint Receipt for Gold Bullion with Black American history context saw spirited bidding to $11,400, more than double its high estimate. The most comprehensive modern offering of Liberty Loan certificates from World War I were featured in the sale. The high denominations were strongly sought after with lot 10096, a Victory Liberty Loan $1,000 bond, fetching $13,200. Realizing the same result was a serial number 1 Fourth Liberty Loan in lot 10088. The 112 lots offered from the John Herzog Collection realized over $650,000, with many different buyers augmenting their collections. Friedberg 202a (W-2600). 1861 $50 Interest Bearing note. Very Fine-25. 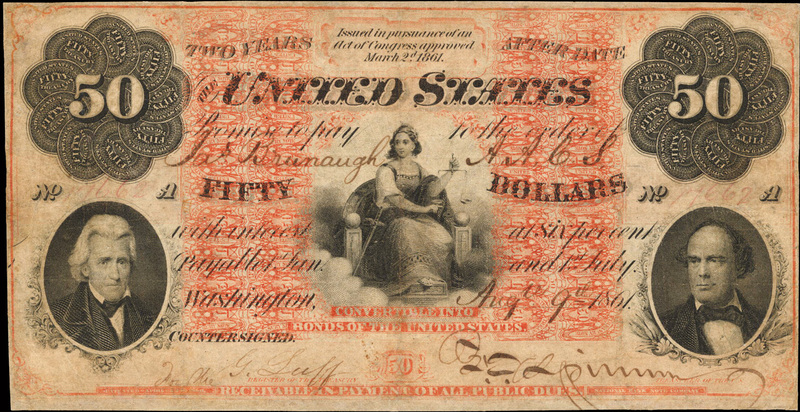 This $50 Treasury Note was the very first currency used during the Civil War. . . As the only surviving example from the entire issue, it holds immense value, not only for the collecting community but also as a piece of United States history. Two lots later, an 1863 $100 Interest Bearing Note (Fr. 204), one of only two known to survive and the only example available to collectors, nearly doubled its presale estimate, selling for $900,000. An important offering of Silver Certificates of Deposit comprised just eight notes but collectively realized over $2.2 million. The top price among these was garnered by lot 2041, the 1880 “Black Back” $1000 Silver Certificate of Deposit (Fr. 346d), one of only two in private hands, which brought $1,020,000. Among Gold Certificates, lot 2051 a Serial Number 1 “Technicolor” $20 note that could be traced all the way back to Theodore Roosevelt’s White House resulted in a final price of $552,000. Uncut Sheet of (four) Fr. 227. 1899 $1 Silver Certificates. About Uncirculated 50 EPQ. Serial Numbers 1-4. In addition to the Herzog and Anderson collections, Stack’s Bowers Galleries presented nearly 500 lots of additional United States currency, which spanned Colonial and Continental pieces, Large and Small Size notes, and Nationals and Errors. 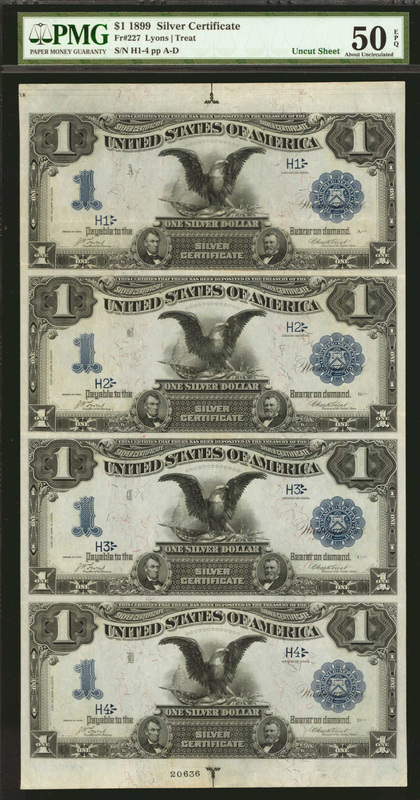 Lot 11046 presented a newly discovered 1899 $1 uncut sheet that featured Serial Numbers 1-4, the first sheet printed for the Lyons-Treat Signature Combination. This sheet, graded About Uncirculated EPQ tripled its high estimate, selling for $180,000. Among Error notes, a mismatched serial number $100 note from the Winters National Bank in Dayton, Ohio (lot 11213), pedigreed to the John Whitney Walter Collection, brought $18,000. Among National Bank Notes, lot 11226 offered the finest graded Small Size Alaska National, a $5 from the First National Bank of Ketchikan (Fr. 1800). Graded Gem Uncirculated 65 EPQ, this prize was bid well past its high estimate, finally selling for $90,000. Presented in lot 11244 was a Choice Uncirculated 63 $2 from the First National Bank of Lincoln, Illinois (Fr. 389a). This note, with the popular Lazy Deuce design and a pedigree to the John Whitney Walter Collection, brought $19,200. Stack’s Bowers Galleries is currently preparing the catalog for their next important United States paper money auction event, the Official Auction of the Whitman Coin & Collectibles Expo, October 24-26 in Baltimore, Maryland. Included will be Part III of the Joel R. Anderson Collection, Part II of the John E. Herzog Collection, and the Caine Collection of Federal Proofs and Essays, as well as a diverse selection of other United States currency. The entire sale will be available at the firm’s website or call 800-458-4646 to reserve a printed catalog. Is anyone else havin this problem or is it a issue oon my end?